Written by Polly Simons for C&I Magazine. SIX years ago, entrepreneur Will Broome found himself staring at his smartphone in the middle of his local supermarket. Trying to navigate the store and decipher a text messaged shopping list, it occurred to him there must be a better way to find the items he needed. “I saw so many people with a traditional shopping list on their phones, and I thought ‘Wouldn’t it be easier if you had a list that jumped into the right order as you walked around?’ he said. “Even if you know the layout of the store really well, there’s always something you forget.” That idea became Ubamarket, the retail app currently revolutionizing UK convenience stores and being tipped as the independent retailers’ answer to Amazon Go. Since launching in 2016, the app has been steadily been rolling out in stores across the UK, and international retailers are finally starting to take note – including in Australia. “A lot of retailers think they will do this sort of thing ‘in the future’, but what they don’t realise is the technology is here right now,” he said. So what is Ubamarket – and do you need it? We find out more. It’s no surprise that grocery shopping isn’t up there on anyone’s fun list. In fact, a recent survey of 2000 British shoppers by Ubamarket and global insights group Kantar Worldpanel found that 30 per cent of Brits regarded grocery shopping as “one of the most inconvenient things I have to do”. Their main frustration? Long checkout queues, with 35 per cent of respondents saying that a lengthy waiting time to pay for goods could deter them from shopping at that store in the future. Not surprisingly, finding ways to speed up the checkout process and make the grocery shopping experience more efficient for customers has been a top priority for retail technologists. “The quest for speed while shopping is the focus of development in the convenience channel, and especially taking the friction out of the experience during checkout and payment,” said Patrick Mitchell-Fox, senior business analyst at insights and research group IGD. At the same time however, customers aren’t prepared to give up the in-store experience entirely, with 78 per cent of shoppers in one 2016 survey saying they still prefer to shop in-store. “People want a hybrid experience – the convenience of shopping online, but with the physical experience of being in a store,” said Broome. Ubamarket aims to combine the best of both worlds, offering in-app payment alongside features designed to streamline the in-store experience, from building a shopping list to navigating the aisles and applying store promotions and loyalty points. “The key at the heart of Ubamarket is that unless one app does everything, people won’t use it,” Broome said. So how does Ubamarket work? After downloading the app through the App Store or Google Play, customers input their shopping list and their chosen supermarket. The app then re-arranges items according to the store layout, and directs customers where to find them as they navigate the aisles. Using their smartphone camera, customers scan items – including those by weight – as they go, with store promotions and customer loyalty points added automatically. They can also scan barcodes to check a product’s ingredients listing, allergy alerts, nutritional information and environmental impact. A recipe component, where customers can upload ingredients for a specific meal, is also in the works. Customers finish their shop by tapping their smartphone at a payment point, without the need to unpack or re-scan purchases. Currently, the app only allows customers to pay at self-checkout areas, but Broome hopes they will soon be able to check out anywhere in store. “I think it will happen, but probably not for a couple of years. We’re ready to push the button when retailers are,” he said. For Lucy Worrall, marketing manager of Warner’s Budgens, which runs six independent supermarkets in England’s picturesque Cotswolds region, the initial drawcard of Ubamarket was that it could be rebranded to fit the Warner’s Budgens name and incorporate its existing Taste Club loyalty program. The group’s Moreton-in-Marsh supermarket was the first store in the UK to use Ubamarket when it launched in 2016, but Worrall said customers were initially skeptical. “We have a large percentage of older customers who do not have a mobile phone, or if they do have a mobile phone, it certainly isn’t a smartphone,” she said. 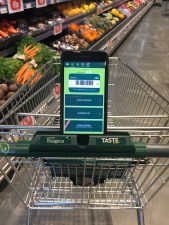 Introducing the app under the Warner’s Budgens name meant that customers already trusted the app, and now older shoppers are some of its most frequent users. “It gives our customers access to an app that is not only a place where they can write their shopping list and use as a scanner, they can also view the exclusive promotions and offers they receive, how many points the have earned as a shopper and what this is worth in monetary terms,” Worrall said. Since its introduction, basket spend for users of the app has increased by 21 per cent compared to non-users and Worrall has noticed an increase in the number of Taste Club members redeeming offers, something she attributes to customers being able to view them on their phone rather than struggling to remember what they are. “That’s definitely a big benefit in our eyes,” she said. Worrall is not the only one singing Ubamarket’s praises. Since Amazon Go’s first store opened in the US, Broome says he has been inundated with calls. “It’s really piqued interest in us,” he said. Last month, Ubamarket launched its “flagship” London store in the upmarket suburb of Islington, and the app recently landed at its first non-Budgens store, opening as part of the Londis group of convenience stores in Southampton on England’s south coast. More stores are on the way, including one at Leeds University. And as for Australia? Well, Broome will only reveal that he has interest from a major international forecourt chain and a UK-based symbol group with more than 100 stores across the country. “The possibilities are huge and we are talking to absolutely everybody,” he said. Not just useful for customer loyalty programs, EpoS (electronic point of sale) data will be used to streamline back office systems and create more detailed budgets and cash forecasts.